برنامج الكودك المعروف K lite mega codec pack بإصداره الاحدث رقم 12.4.4 , هو برنامج تشغيل الميديا المعروف ب هوم سينما Home Cinema 123 , برنامج قوى جداً فى تشغيل ملفات الفيديو و الصوت. هى عبارة عن تجميعة من الكودك ( اكواد تشغيل الميديا ) و الادوات اللازمة لفتح اى منها فى حزمة واحدة , تتميز بدعم التحديث المستمر من قِبل المطورين للحزمة, و يمكنك متابعة التطويرات عن طريق الموقع الخاص بالمطورين . البرنامج ميديا بلاير كلاسيك يعتبر من أقوى برامج الكوديك الذي يحمل حزمة هائلة من الترميزات لتشغيل الفيديو و الصوت و التي لاقت محط إعجاب الملايين من المستخدمين لإمكانياته الكبيرة في تشغيل الافلام و بجودة عالية و تسطتيع ملاحظة ذلك من قِبل الآراء المكتوبة عن البرنامج فى هذا الرابط ، تأتي حزمة كي لايت ميجا كوديك باك بحل قوى يكمن في التخلص من مشاكل الكوديك و عدم القدرة على تشغيل بعض مقاطع الفيديو والافلام، يمكنك الآن تشغيل مقاطع الفيديو المفضلة لديك و أيضا تشغيل أفلام عالية الدقة HD و أيضا يمكنك تشغيل ملفات الترجمة للأفلام بكل وضوح، بحيث يقوم برنامج ميديا بلاير كلاسيك بإظهار الترجمة على الأفلام بخط واضح و هو يدعم جميع أنواع ملفات الترجمة الخاصة بالافلام. إضافة ترميز الفيديو LAV encryption. حذف Gabest Real Media Splitter. The Mega variant is the biggest of the four variants of the codec pack. It contains several additional components compared to the Standard and Full variant. 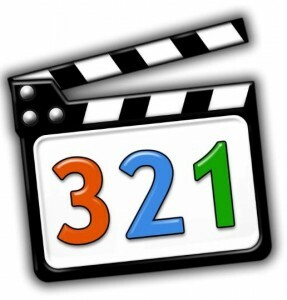 Most importantly, ACM/VFW codecs that can be used for video encoding/editing. 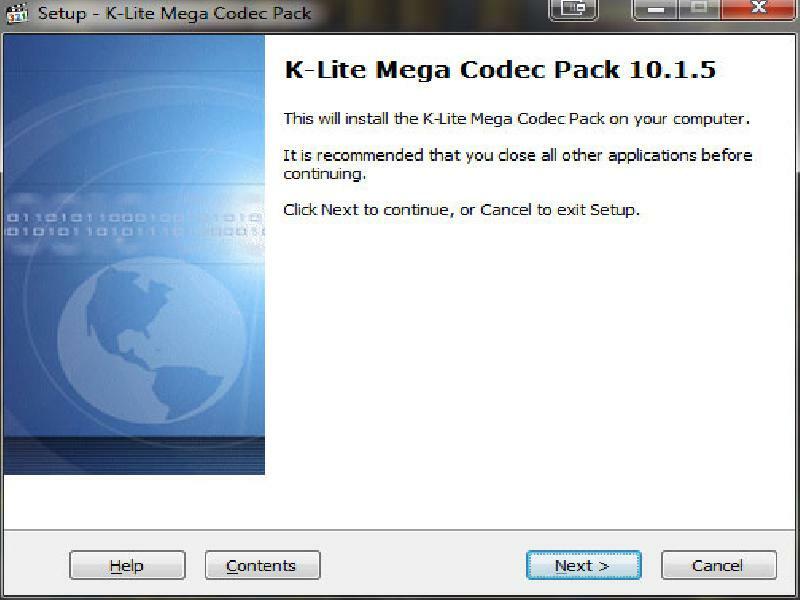 K-Lite mega Codec Pack Standard represents a collection of audio, video and subtitle codecs, required to play stream online or offline without any issues. 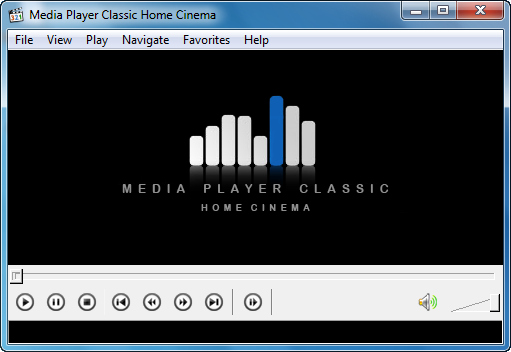 It contains Media Player Classic and offers support for DVD playback. The installation procedure can be carried out in three ways - simple, normal, or advanced, depending on the user's level of experience. The complete package includes MPC-HC player, DirectShow video decoding filters (H.246, MPEG-2, MPEG-4, VC-1, Windows Media video, and Flash video), audio decoding filters (AC3, DTS, E-AC3, TrueHD, MLP, LPCM, AAC, MP1, MP2, MP3, and others), source filters (AVI, Matroska, MP4, MPEG-TS, MPEG-PS, Monkey's Audio, and others), along with subtitle filters (DirectVobSub, others). One of the best programs used these days to display media files everywhere, due to its speed and stability. it's a freeware , so you can download it whenever you want and use all its features. Additional components contain tools (CodecTweak Tool, MediaInfo Lite), Explorer shell extensions (Icaros ThumbnailProvider and PropertyHandler), and miscellaneous items (detect broken codecs and DirectShow filters). Furthermore, you can select the decoding method between using software decoding, LAV Video - DXVA2 native, and LAV Video - DXVA2 copy-back. 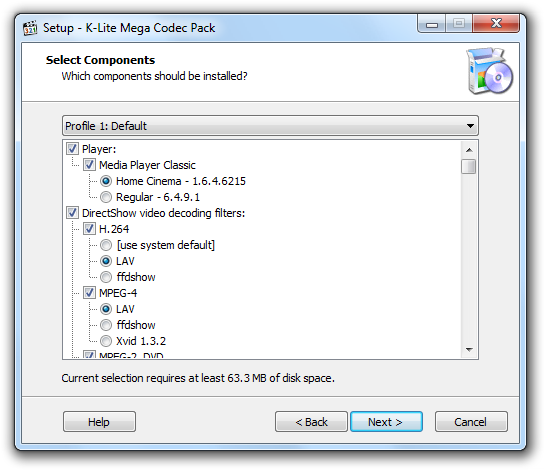 K-Lite Codec Pack Standard has a configuration panel for each main module, which enables the user to fully customize settings for each codec. The application is light on the system resources, and it doesn't interrupt normal activity on the computer. It has a good response time and applies new changes rapidly. We have not encountered any issues in our tests. Aside from the standard edition, users may be interested in looking into K-Lite Codec Pack Full for extra features. All in all, this codec packs is a welcomed addition to any user who wants to successfully play multimedia files.